Just in the Nick of Time.. Stir up your gifts for Christmas gift giving. In the North Pole kitchen elves have been making special treats! These little elves have decided to share some of their most festive recipes with you. Chocolate Stained Glass Candies, Double Fudge White Chocolate Brownies in a Jar, and Sweet Almond Rolls are some of this season’s favorite go-to-gifts for giving. With a little bit of elf magic in a twinkling of an eye, you will have these treats ready to give at a moments notice. 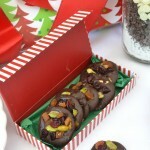 The gussied-up food ideas are easy, quick and just In the Nick of Time for holiday gift giving. Elf ism number 1: “It’s the thought that counts” when giving food as gifts to family and friends. Nothing taste better than home baked goodies, but if you are not a baker, no worries, the Chocolate Stained glass candies will be you’re go-to-recipe. Chopped dried apricots and cranberries with pistachios are placed on top of melted dark chocolate rounds that look like stained glass windows once set up. No stirring, no blending, no refrigeration, just drop and stack the chocolate rounds with dried fruits and nuts. Once the candy is firm it can be stored in a covered container with waxed paper between layers until ready to package. You will have a hard time keeping your family out of these treats so make sure you make double the recipe. For this candy, Ghirardelli 60% Cacao baking chips were tested and proved to be the best morsels for this treat. The candies set up the quickest and stayed firm. Elf Tip: Go for the good stuff and not the candy coating for best results. Elf ism number 2:“Celebrate everyday like Christmas”. If you are baker, then you will love the tree presentation of the almond filled sweet Danish. Sweet yeast bread is made ahead and refrigerated over night before rolling and baking. The refrigeration process allows the yeast to mellow with the sugar and butter to create a soft delicate rich flavored sweet roll. The dough is rolled into a rectangle, filled with a prepared almond filling, rolled like a jelly roll and sliced into 1-inch rounds. After allowing the rolls to rise, bake and cool, a creamy white glaze is drizzled over the tops. 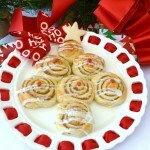 For gift giving, the rolls are placed on a white round serving plate in the shape of a Christmas tree. A cut out butter cookie in the shape of a star is placed at the top of the tree. Tiny red M& M’s are edible ornaments for decoration. Your gift includes the white serving dish as well as the delicious home baked pastry, perfect for Christmas morning. Elf Tip: Allow the rolls to cool completely before glazing or the glaze will run off and not look pretty. Elf ism number 3: “Sending your best with a homemade treat means so much more!” Sometimes the elves have to pass on baking and they make mixes in a jar for gift giving. 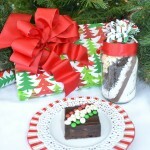 A brownie or cookie mix in a jar with a recipe card and a baking pan makes the best gift for anyone who loves home made baked goods. Even if they don’t bake, this gift will inspire them to try. The easy-to-make mix is placed in a large bowl with added ingredients. The recipient stirs up the batter and bakes. Double fudge white chocolate brownies in a jar include white chocolate chips, semisweet chocolate chips and special dark cocoa. The dry ingredients are layered at an angle inside the jar. Elf Tip: To create the layered angle appearance of the mix in the jar, simply tilt the jar and add each dry ingredient through a paper funnel while the jar is tilted. After the jar is filled, stand it upright, cover the lid with festive fabric or wrapping paper and attach the band to the jar. Ta Da! Done! Speaking of presentation before you start creating these fun recipes, think about how you will present the gift. Stir up your creative gifts within you for gift giving. Search your cabinets or shops for interesting jars and containers for clever packaging. Sometimes it is easier to find a cute jar or serving dish first then figure out what you can make or bake to fill it. If you bake a cake, consider giving the gift on a cake stand or give a brand new muffin tin with fresh baked muffins or cupcakes as a total gift package. Layering bows and ribbons, special gift tags and chalkboard labels, cookie cutters or kitchen utensils related to the food gift can be attached to most packages. Line simple tins with pretty papers or lovely linens for presents. Create your own packaging ideas and turn these recipes into memorable gifts for your family, friends, co-workers, teachers and neighbors. Elf ism number 4: ”Saddle up the reindeer and lets ride.” Santa has many elves around the world not just the North Pole. There is a little bit of elf in each of us. It’s not too late to bake or make something creative this Christmas. Stir up your inner joy and spend an afternoon in the kitchen with your little elves; not only will you create something delicious you will be making memories just In the Nick of Time for Christmas! The dry mix is given to the recipient in a decorative jar with an attached recipe card for them to bake with a few added ingredients. Giving a baking pan with the mix and recipe would be a great package. In large jar or quart mason jar, layer sugar, cocoa, flour, baking soda, salt and white morsels, then chocolate morsels at an angle. Tilt the jar and add each ingredient through a paper funnel while the jar is tilted. Stand up right and cover with lid and band. To make brownies, place mix into large bowl. Stir in 1 cup melted butter; add 4 eggs and 1-teaspoon vanilla. Blend well. Spread batter in a lightly greased 13 x 9-inch pan. Bake at 350 until done, 40-50 minutes. Cool well and refrigerate before cutting. Frost brownies with chocolate buttercream frosting if desired and decorate with red and green mini M & M’s and white chocolate chips. Lightly spray with cooking spray, set aside. Place chocolate morsels in a zip lock sealed bag. Immerse this bag in a bowl of very warm water, knead bag until morsels are completely melted. Pat dry baggie filled melted morsels completely. Clip one end of bag and pipe small 1-1 ½”rounds onto baking sheet. Immediately add chopped fruits and pistachios on chocolate rounds. Let chocolates set until firm for about 2 hours before storing. Candies are best served with in 2-3 days. Place candies in a covered container with wax paper sheets between layers. Heat water in a microwave safe bowl 30 seconds until temperature is 110 degrees. Add 2 teaspoons sugar to water, stir to mix, add dry yeast. Let yeast sit until it proofs. Meanwhile, sift flour with 2 Tablespoons sugar and salt and place in a large mixing bowl. Add softened butter to flour mixture, toss with pastry blender or hands until mixture is mealy or well blended like the size of peas. Add proofed yeast and evaporated milk to flour, add eggs. Mix well until smooth. Do not over mix or beat batter. Cover batter with plastic wrap and chill dough over night or at least 2 hours. Assemble rolls: Cut dough ball in half. Roll out one half of chilled dough on floured surface to a 9 x 12-inch rectangle. Spread half of the almond filling over the center and to the edges of the rolled rectangle. Starting on long side of rectangle, roll dough tightly into a jellyroll. Seal edges and slice roll into 1” slices. Place rolls on parchment lined baking sheet, Allow rolls to rise double in size, then bake at 350 for 15-20 minutes or until golden brown. Cool rolls before glazing. Glaze: ½ cup confectioners sugar, 1 teaspoon evaporated milk, ¼ teaspoon crème bouquet or vanilla extract, mix to desired consistency. Drizzle over rolls before serving or presenting. To serve as a gift: Place rolls in shape of Christmas tree on serving platter, Drizzle rolls with glaze right before serving/wrapping gift. A cut out star shaped butter cookie can be used as the tree topper. Tip: You can bake the rolls and freeze them with out glaze for up to 6 weeks. Be sure to wrap in plastic wrap and foil or sealed freezer container to freeze. Thaw before gift giving. Liz Bushong is an expert in the three-dimensional art of entertaining. She transforms simple dining occasions into beautiful and memorable moments by adding a touch of her own “sassy style”. For the past several years Liz has been entrusted to decorate several high profile homes for the Holidays including the White House, Vice Presidential Personal Residence, Governors mansions and more. She is a featured monthly guest chef/designer on regional CBS/ABC Affiliates Daytime Tri-Cities, Daytime Blue-Ridge Roanoke and other television shows. Liz is the author of Just Desserts and Sweets & Savories cookbook as well as a contributing writer for several magazines including VIP SEEN & Lovely Bella. All recipes, food styling, photography and article are created and developed by Liz Bushong. Please link this website if you reference any content in this article. Thank you!